King Arthur’s Round Table. Legendary. Symbolic. Romantic. Every knight who sat there was equal to every other knight. 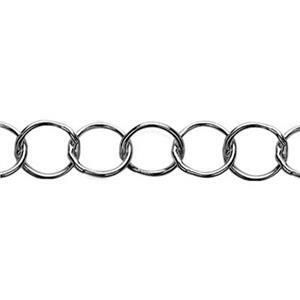 Our 3.2mm Round Link Cable chain – each individual sterling circle is consecutively equal to the next circle and so on and so on. Entwine your jewelry ideas with this bright sterling silver chain and create your own legendary designs. Notes: Chain link inner diameter will accommodate 12 gauge jump rings or smaller. Bulk chain is priced per inch. All chains are sold in 12 inch minimum quantities unless a 10 foot minimum is noted. We may use segments of 7 inches or longer to fulfill your order if continuous lengths are not available. Spooled lengths are segmented at the factory so we cannot guarantee continuous lengths of any specific measure.